Ticonderoga has an irresistible backstory. Jamie Saft and Joe Morris discovered a mutual love for John Coltrane’s much-maligned 1966 album Live at the Village Vanguard Again! Proclaiming Alice Coltrane his favorite pianist, Saft wanted to make a record inspired by the album. Morris contacted Joe McPhee, who happened to have been front and center at the Vanguard gig 49 years ago, and Charles Downs, who as Rashid Bakr had drummed for Cecil Taylor, William Parker and other titans of the New Thing. The quartet convened at Saft’s studio in upstate New York and banged out four collective improvisations. It comprises a dense hour of music in the classic Clean Feed mode of dynamic intensity and reflective eruption. The participatory focus is sharp indeed. Saft unplugs all his keys and gadgets and channels his inner Alice. His rainbow swirls are a glissando of pure ivories, and his occasional forlorn passages of harp-like fragility inevitably swell into cantering block chords to run with the herd. 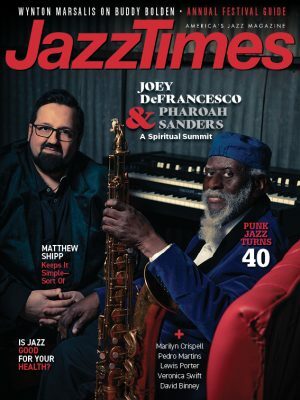 McPhee likewise downsizes his arsenal to a Trane-ish complement of tenor and soprano saxophone, on which he blows a fusillade that gathers Coltrane’s lyrical shards but doesn’t forget to include the unremitting wail of Pharoah Sanders, who was the Vanguard gig’s primal heat. Morris forsakes his guitar for the rumble of the bass, which burrows clean through grooves. He is deprived of the lengthy soloing accorded Jimmy Garrison at the Vanguard, but is a force of nature on “Leaves of Certain” and a vibrant presence throughout. Downs deploys his expertise at reframing cacophony into more recognizable rhythmic waves. The quieter moments on Ticonderoga feel like preludes, or drainage. Vanguard Again! was derided because it was such a revelry in sound. The four musicians here cherish the differences in fabric, and the abiding warmth, in the sheets they create.